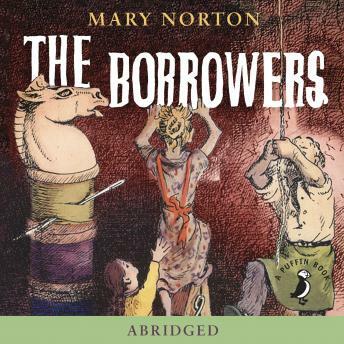 Penguin presents the abridged, downloadable audiobook edition of The Borrowers by Mary Norton, read by Samantha Bond. Pod, Homily and Arrietty are a family of tiny people who live beneath the floor, behind the grandfather clock in the old rectory. They own nothing - everything they have is borrowed from the 'human beans' who don't even know they exist. Arrietty's father, Pod, is an expert borrower. He can scale curtains using a hatpin and bring back a doll's teacup without breaking it. Girl's aren't supposed to go borrowing, but as Arrietty is an only child, Pod breaks the rules. But when she is in the house borrowing, something happens which changes their lives. Arrietty makes friends with 'the boy upstairs'.